This change to the virtual has its root in the rise of affordable mobile technology and innovative software applications such as LAYAR and Junaio, which have allowed artists to make use of them in new ways. The application mobile technology in the realm of the arts has lead to completely new forms of art and has brought about new ways to consume and mediate it outside of the practices of established platforms such as museums and galleries. Further, artists have also found new solutions in terms of presentation and the ability to position “art” per se as an integral part of the community. The availability of art has increased and is now being consumed by a larger, more diverse audience. New aesthetics have emerged and are still maturing from the mobile arts movement and the way of understanding the arts today for artists, curators, theorists, and arts manager now entails intermediating between the real and the virtual, as well as between the artist and the larger non-museum going public. 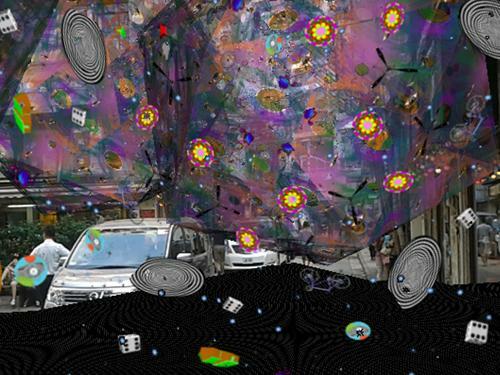 What is Augmented Reality Art? In a similar way to the British graffiti artist, Banksy who in the early 90s’ went beyond the gallery walls by adding a touch of optical integration into street art, artists using Augmented Reality today to virtually place their work in public space can be understood more or less as the technically hip graffiti artists creating the street art of the 21st century. 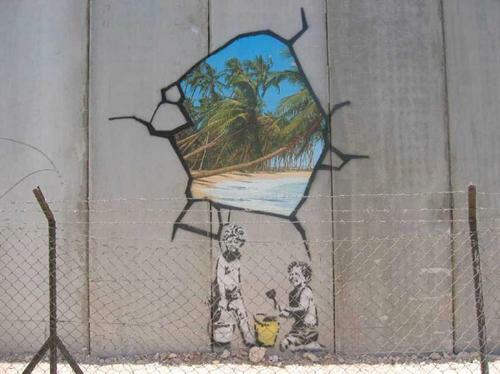 They, like Bansky have re-validated public space as a viable venue for the arts. But what exactly is Augmented Reality and how does it work? In its simplest sense, Augmented Reality enhances a real-world environment with graphics, audio or other stored or generated media. In this way, Augmented Reality is really the art of combining virtual content with physical reality. It can also involve engagement through interactivity and force the viewer into proactive participation in a way yet unknown to the art world. AR artists have taken diverse approaches in terms of creating artworks using AR technology and these approaches can be passive or active in terms of interactivity and can include moving or non-moving images in 2D and or 3D. However, the art-object itself is actually of second importance, because the actual context of the artwork and how the visitor “explores” the work plays much more of a decisive role in terms of the artwork’s identity. It is also important to understand that some AR artworks are viewable at only specific locations while others are viewable everywhere. In the opinion of the authors, those artworks that are at fixed locations tend to be of more relevance to the genre, because they stand in a more intimate relationship to the environment that they are placed in, offering a stronger dialog between the work and its locations. Some AR artworks are always facing you, meaning that the spatial relationship between the viewer and the artwork stays in constant relationship, but a few AR Artworks allow you to walk into them, letting the viewer explore them from the inside as well as from the outside. Interactivity belongs to a second generation of AR artworks and it is important factor, because its use affects how an AR artwork appears and more so how it redefines the virtual space it is occupying. This type of interaction is unique to the genre and perhaps for the first time in history that the viewer is able to physically explore an artwork in such a way. In “Things We Have Lost” by John Craig Freeman, EEG is used to create interactivity between the viewer and the artwork. The work uses a database of objects that were collected by first asking the people what they’ve lost. These include a broad range of lost items from the usual things such as wallets, watches and money to less usual such as pensions, empires and dodo birds. During viewing, the participants conjure up the virtual objects by simply imagining them into existence using the brainwave sensor technology provided as they walk through the city. With the artwork, “Biomer Skelters” by Will Pappenheimer and Tamiko Thiel, it can be seen that AR has moved from its initial Bansky like beginning to fully interactive mobile artwork. For this work, a tour guide, wearing a heart rate monitor plants indigenous or exotic vegetation as they move through the city. Technically this works as follows. The heart rate of each tour guide is picked up and then transmitted via Bluetooth to an Android cell phone. The tour guide starts a custom program and begins walking through the city and the phone begins to vibrate as vegetation is planted. The guide can walk as long as wanted, planting vegetation. In terms of the group being guided, each of its members uses an iPad or a cell phone logged onto the Biomer Skelters Layar from which they can view the creation trail and population of vegetation created by the guide. Works using AR are not only genre works or “art for art” per se. On account of the tools involved, how the artworks use public space, and the connections that can be made between the artwork and space, they are able to pick up on make diverse statements, become integral parts of missions (such as Sustainability) and take on diverse forms of representations and communication. ”Augmented Reality is a new Form of Art, but it is Anti-Art. It is Primitive, which amplifies its Viral Potency. It is Bad Painting challenging the definition of Good Painting. It shows up in the Wrong Places. It Takes the Stage without permission. It is Relational Conceptual Art that Self-Actualizes”. 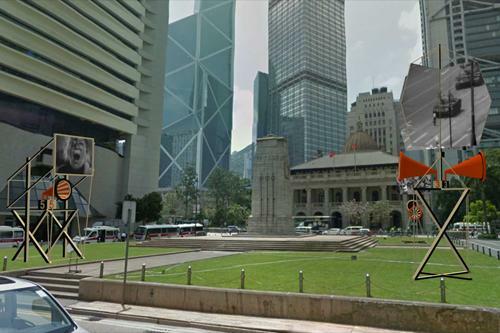 AR artists often use various forms of Virtual and Augmented Reality as a medium for exploring social and cultural issues in site-specific artworks. Although it seems to be a rebellious vision with unpredictable outcomes, there are some works that are part of important trends such as climate change awareness, human organ donations, the importance of urban planning, clean energy, amongst others. One of the members of ManifestAR, John Craig Freeman who has been working for over twenty years with emerging technologies specific to virtual space, created a work consisting of a multipart public installations at sites around the world where the forces of climate change are impacting the lives of individuals in local communities. Making a strong statement about the environmental situation that we are all presently confronted with, the artist consequently marks the contour of the expected rise in sea level fifty years from now. 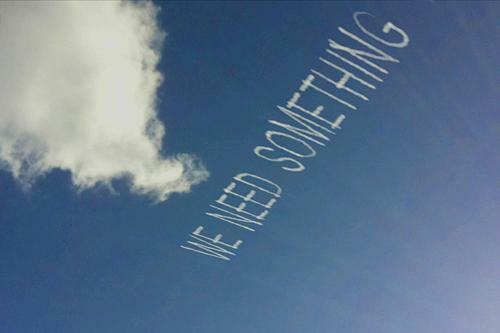 Another note worthy contribution to creating environmental awareness through AR is found in the work of Tamiko Thiel. 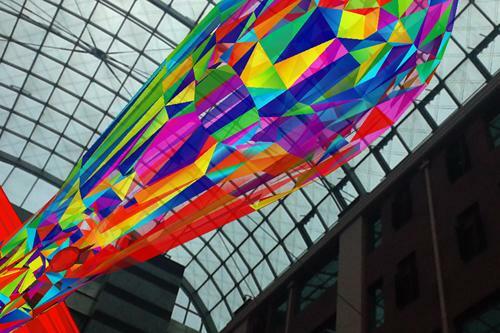 As an artist, she implements various forms of AR in site-specific artworks as a medium for exploring social and cultural issues. Her work “Clouding Green” is based on the Greenpeace study on “How Clean is Your Cloud” – a study that deals with clean energy usage by server farms. 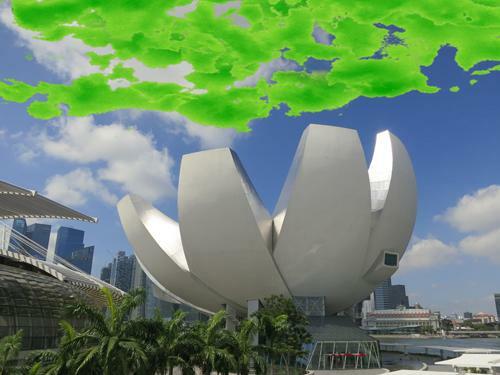 This work, recently exhibited during the Digital Art Weeks 2013 in Singapore in the virtual space directly over the ArtScience Museum at Marina Bay Sands, consists of group of clouds ranging from sooty to a brilliant green in color. The hue of the cloud indicates the percentage of renewable energy used by each company’s server farms. This artwork shows how AR can aid the clean energy movement through making people aware of it and by presenting a systematic ranking of companies that are pursuing alternative energies to fire their server farms. In terms of interactivity, the artist adds a feature that lets viewers “touch” a cloud and receive information on the company that is linked to that particular cloud. 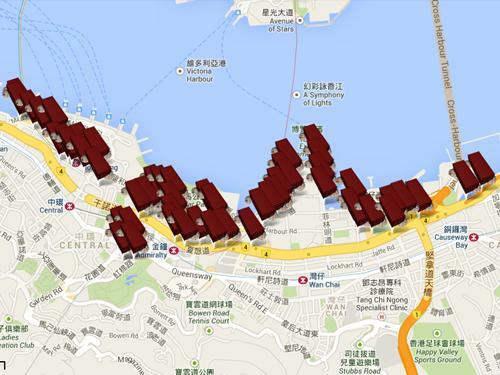 Basically, the work transform abstract data into a visually and an emotionally striking overlay on the user’s immediate physical surroundings, creating an emotional impact on the viewer that other forms of data visualization simply can not provide. Unfortunately, despite all its positive outcomes and the thrill for experiencing the arts from a different angle, the reality of AR artworks could use and still deserves much more visibility. AR artists and curators have relentlessly struggled to achieve proper recognition from established Museums, but for some unexplainable reason continue to protect their status quo by underlining the “need for the real”. Fig.10. 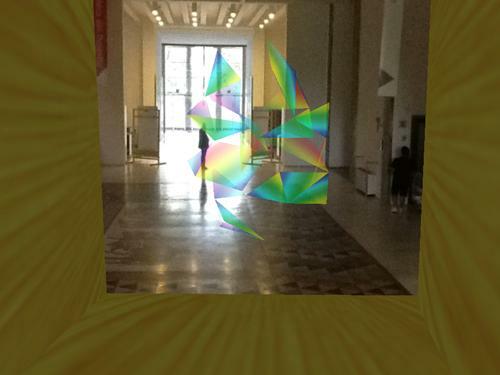 Guerrilla action AR at the MoMA New York organized by artists Sander Veenhopf and Mark Skwarek. 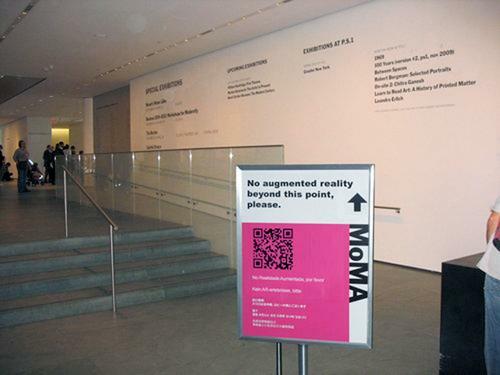 As a rather drastic response to this institutional positioning, the AR artists Sander Veenhopf and Mark Skwarek uninvited installed the exhibition “We AR in MoMA” in the Museum of Modern Art in the New York in 2010. In a time where technology has become a fundamental force in bringing about social-cultural change, Museums should consider becoming more aware of what one might call a “new mission” in regard to how museums market and communicate to their target audiences. 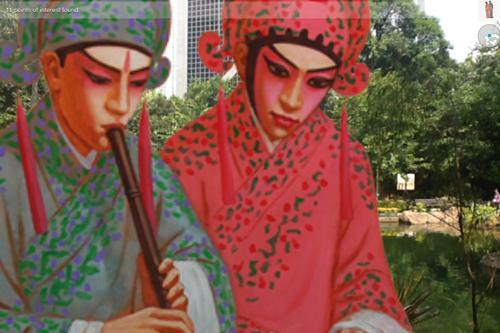 This includes not only change the commonly accepted cultural logic with which arts is produced, distributed, displayed and marketed, but also how it is supported, preserved and communicated to the public. The appearance, growth, and establishing of the AR Art movement is indicative of how artistic practice, curatorial approaches and institutional presentation are becoming increasingly linked to emerging technologies. If one continues with the formula public space + technology = art experience, it leads us to a wide range of new organizational application and management strategies within a wider institutional context, which will clearly continue challenging the conventions of how contemporary art is expressed and experienced. In the world as in the art world, much is changing and the real has been affected by the virtual and the expectations of an audience in regards to artists or to an institution that presents artwork are causing both to delve farther into the subject of the virtual. What is significant here is that it is no longer the real object itself that will head an exhibit, but its digital counterpart in context of the object it surrounds, offering to the visitor an experience both virtual and real. The success of any institution for the presentation of arts in the 21st Century will depend solely on its abilities to communicate to the public, who being digital natives breed in virtual worlds will no longer accept being presented with solely things real.